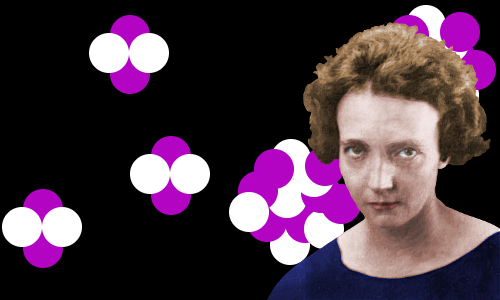 Irène Joliot-Curie discovered how to synthesize ‘designer’ radioactive elements in the laboratory. Such elements are now used in tens of millions of medical procedures every year. Their use has saved millions of lives. The daughter of Marie Curie, Irène followed in her mother’s footsteps, winning a Nobel Prize in Chemistry. Irène Curie was born on September 12, 1897 in France’s capital city, Paris. Her mother was Marie Curie and her father was Pierre Curie. At the time of Irène’s birth, neither parent was well-known, but that would soon change. 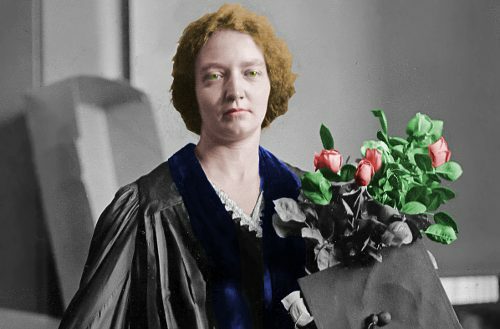 In 1903 her parents received a share of the Nobel Prize in Physics, and in 1911 her mother was awarded the Nobel Prize in Chemistry, becoming the only scientist in history to win both prizes. Irène was a very shy child who had to compete constantly with her parents’ powerful devotion to science. She felt they did not spend enough time with her. As she grew, Irène increasingly craved her mother’s attention. Pierre’s father, Eugène Curie joined the household shortly after Irène’s birth. His wife had died shortly before this. Grandpa Eugène, a retired medical doctor, soon became the young girl’s best friend and first teacher. They were both looking for sympathetic company. In the spring of 1906, when Irène was eight years old, her father Pierre was hit by a carriage in the street and killed. Following Pierre’s death, Marie asked his father to continue living with the family, which now consisted of Grandpa Eugène, Marie, Irène; and Irène’s younger sister Eve, who had been born in 1904. Grandpa Eugène had a great influence on Irène’s intellectual development. He cherished her dearly, introducing her carefully to the sciences and also the works of his favorite author, Victor Hugo. Grandpa Eugène died in 1910, when he was 83 years old and Irène was 12. Marie Curie stepped into Grandpa Eugène’s shoes, rising early to give her children lessons each day before going to her laboratory. She also ensured the girls were physically robust, engaging them in horse riding, hiking, swimming, skiing, and acrobatics. Speaking to her colleagues at the Sorbonne, Paris’s highly prestigious university, Marie discovered dissatisfaction with the education available to children in Paris. Marie and some of her colleagues decided to take matters into their own hands; each would use his or her expertise to educate a class made up of all of their children. Irène and Marie Curie. As a young girl, Irène was taught physics by her mother. Later, she worked as her mother’s laboratory assistant. Few young children have ever been taught by such illustrious teachers! Although Irène only attended one lesson a day, she was gripped by a tremendous passion for science and became a relentlessly hard worker. After two years, the informal school was dissolved. Preparing and delivering lessons to children in addition to all their other duties had proved exhausting for the teachers. And anyway, to enter university, the children needed officially recognized qualifications. In 1911 Irène traveled to Stockholm, Sweden to see her mother receive the Nobel Prize in Chemistry. After this, the 14-year-old girl did a good deal of traveling. While she traveled, she studied mathematics and physics, solving problems sent by her mother and teaching herself from books. During this time her mother was ill and was being cared for quietly. In the summer of 1912 Irène met her mother’s friend Albert Einstein for the first time. Einstein, vacationing in the Swiss Alps, was very impressed by the 15-year-old girl’s passion for and thorough understanding of physics. Irène returned to Paris in September 1913 to attend ‘normal’ school lessons at Collège Sévigné. Within a year of her return, World War 1 began. Marie Curie, determined to assist her adopted country against the German invaders, set up mobile radiology units. She intended using x-ray photography to diagnose wounds and locate shrapnel embedded in soldier’s bodies. Irène, age 17, took a nursing course in addition to work she was doing for her school certificate and courses she had begun at the Sorbonne. Soon, Irène was teaching radiology to nurses recruited by Marie Curie to serve in her field radiology units. Irène then served in battlefield hospitals herself, taking x-rays. For a girl who had lived a protected, comfortable life, there was real horror in being confronted with the gaping wounds and terrible suffering endured by soldiers serving in the trenches. Irène was mature beyond her years and mentally strong. Her mother came to see her as an utterly dependable rock and comfort. If ever there were problems, her daughter was tough enough and intelligent enough to solve them. At the end of the war, Irène was honored by the French Government with a military medal. With the war over, Irène completed her degree in mathematics and physics at the Sorbonne. Age 21, she became her mother’s laboratory assistant at the Radium Institute, which her mother had founded. During the war, so many men had been killed that the majority of research workers at the Institute were women. When Marie Curie was away from the laboratory, she left her totally reliable young daughter in charge. Irène was highly capable, but there was jealousy about her status among some of the more experienced scientists. Irène ignored this, and focused entirely on her research and the work of the laboratory. She could be very direct and blunt with people who were not working well. Irène Curie, age 23, accepting an honorary degree on Marie Curie’s behalf. Irène often stood in for her mother, who often suffered ill-health caused by high radiation exposures. At the age of 25 Irène received her Doctor of Science degree for researching the radiation emitted by polonium, one of the elements discovered by her mother and father. Although science may have been paramount, there were other considerations. One day, her mother asked Irène to train a new arrival to the laboratory in handling radioactive materials. His name was Frédéric Joliot. The two enjoyed each other’s company, and in 1926 they married, taking the surname Joliot-Curie. They began signing their research work jointly in 1928. In their joint research work, Irène tended to work on the chemical aspects while Frédéric worked on the physical aspects. Rather remarkably, the husband and wife scientific team of Irène and Frédéric Joliot-Curie carried out research that could have won three separate Nobel Prizes. However, they misinterpreted results from two sets of experiments. Interpreted correctly, one set of results could have led them to discover the neutron, and the other the positron. In the early 1930s, only the names had changed. Instead of Marie and Pierre Curie racing against Ernest Rutherford, Irène and Frédéric Joliot-Curie were racing against James Chadwick, Assistant Director of Research in Rutherford’s laboratory. At the beginning of 1932, Chadwick read that the Joliot-Curies had ejected protons from wax using, they believed, gamma rays. The evidence was convincing; but Chadwick did not believe gamma rays were powerful enough to do this. Chadwick drew the conclusion that the protons had actually been ejected by the particle he was searching for – the neutron – the particle his boss Rutherford had first proposed and named in 1920. Chadwick now repeated the Joliot-Curie’s experiment and found the protons behaved exactly as they ought to if they had been hit by electrically neutral particles with a mass similar to the proton. Chadwick had discovered the neutron. Quickly he notified the prestigious science journal Nature of the Possible Existence of a Neutron. The discovery brought Chadwick the Nobel Prize in Physics in 1935. The Joliot-Curies had missed out. Science can be unforgiving of lapses! The Joliot-Curies’ (small) consolation prize was they were the first people measure the neutron’s mass accurately. Pushing their disappointment aside the couple began a new investigation, using alpha-particles – fast moving, positively charged helium nuclei – ejected by the radioactive element polonium. On January 15, 1934, after bombarding aluminum foil with alpha-particles, Frédéric noticed something puzzling. The bombarded aluminum was emitting positrons, and continued to do so even after the bombardment of alpha-particles had stopped. He told Irène, who instantly identified what was happening: the alpha-particle bombardment, she said, had converted stable aluminum atoms into radioactive atoms – the first ever artificially created radioactive atoms. In fact, the Joliot-Curies had converted aluminum atoms into atoms of radioactive phosphorus-30, an isotope of phosphorus that – with a half-life of 150 seconds – had never been observed in nature. Ever mindful of Rutherford’s words – “I have to publish my present work as rapidly as possible in order to keep in the race” – the Joliot-Curies presented their evidence for a new radioactive element to the French Academy of Sciences on January 19. This time, they were determined to be first! They went on to repeat their success, bombarding a number of lighter elements with alpha-particles. They produced radioactive nitrogen from boron and radioactive silicon from magnesium. Although it is sometimes said the Joliot-Curies were the first scientists to achieve the alchemists’ dream of transmuting one element into another, this is not true. They were the first to transmute stable atoms into radioactive atoms. Ernest Rutherford was the first to transmute stable atoms into stable atoms. In 1919 he had converted nitrogen into oxygen by bombarding nitrogen with alpha particles. Rutherford was right about the discovery’s ultimate importance. It has allowed scientists to tailor radioactive isotopes with specific properties for use in medicine. For example, technetium-99 is now used worldwide in tens of millions of medical procedures every year and its use has saved millions of lives. Marie Curie, desperately ill by now, survived long enough to see her daughter make a truly historic discovery. The two-time Nobel Prize winner was thrilled to take in her hands a test-tube containing some of the radioactive phosphorus created in her Radium Institute. She also heard whispers that her daughter and son-in-law would receive the 1935 Nobel Prize in Chemistry for their discovery. Sadly, Marie Curie died on July 4th, 1934, before the Nobel Prize announcement was made. Irène and Frédéric had two children: Hélène, born in 1927, became a professor of nuclear physics; and Pierre, born in 1932, became a professor of biochemistry. After winning her Nobel Prize Irène, remembering her own childhood and how she had craved her busy mother’s attention, eased back on her ferociously heavy workload so she could spend more time with her children. Although working fewer hours, she continued working, and in 1946 she became the Director of the Radium Institute. Unfortunately, however, she was not destined to enjoy a long life. Irène Joliot-Curie died age 58 of leukemia in the Curie Hospital in Paris on March 17, 1956. Like her mother, exposure to radiation caused Irène’s premature death. Most likely, Irène’s death resulted from her work with x-rays in World War 1 combined with repeated exposure to radioactive materials during her research activities. Irène’s sister Ève, who had similar childhood exposures to radiation as Irène, but who became a writer, lived to the age of 102! Frédéric Joliot-Curie also died at the age of 58, in 1958, two years after Irène’s death. "Irène Joliot-Curie." Famous Scientists. famousscientists.org. 9 Oct. 2015. Web. 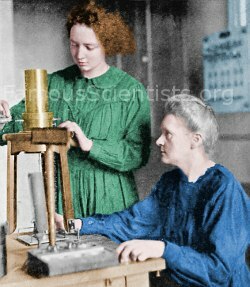 Image of Marie and Irène Curie together in the laboratory courtesy Wellcome Library, London the Creative Commons Attribution 4.0 International Licence. Soraya Boudia & Xavier Roqué, eds.